Connect your Mini-DisplayPort or Thunderbolt video output to a DVI Display. The Mini DisplayPort is a miniaturized version of the DisplayPort interface. First publicly announced by Apple on October 14, 2008, it is used in revisions of the MacBook, MacBook Air, and MacBook Pro notebooks, iMac, Mac Mini, and Mac Pro desktops and also the 24-inch Apple Cinema Display. Unlike its Mini-DVI and Micro-DVI predecessors, Mini DisplayPort is capable of driving resolutions up to 2560�1600, commonly used with 30-inch displays. 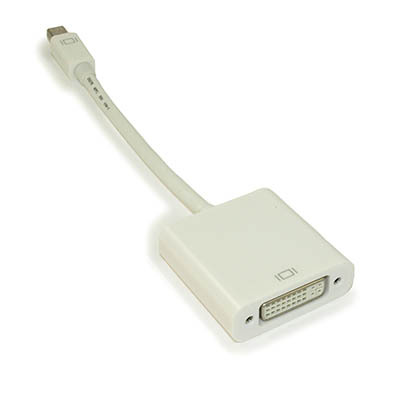 With a suitable adapter, Mini DisplayPort may be used to drive displays with a VGA, DVI or HDMI interface. VESA announced that Mini DisplayPort would be included in the upcoming DisplayPort 1.2 specification. 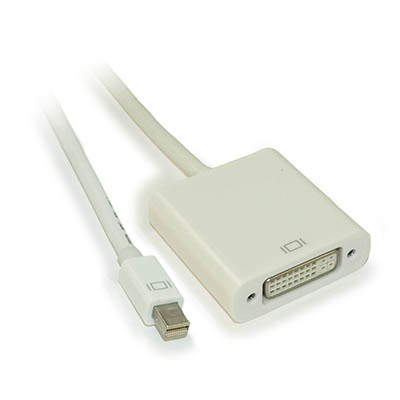 On November 10, 2009, VESA officially announced that the Mini DisplayPort has been adopted. All devices using the Mini DisplayPort must comply with the 1.1a standard. - The Mini DisplayPort specification includes HDCP copy protection, allowing DRM-enabled content providers, including the iTunes Store, to disable playback on any external displays that are not HDCP compliant. - Apple's Dual-Link DVI adapter is relatively large and expensive compared to past adapters, and many customers are reporting issues with all new adapters, rendering it difficult or impossible to connect to external displays. - Mini DisplayPort adapters do not exist for the older component video, S-Video, or composite video connectors. Connectivity can be achieved by converting the Mini DP digital signal, to VGA, an analog signal, and then from VGA to the appropriate signal type.